1985 Schantz replaced a 1962 "Super" 3 manual Allen featuring 500 spealers. By 1984 it had become disfunctional and the church could not even give it away. When we added the first phase, ground floor, of our present Church in June, 1931, we used the organ which was removed from Epiphany Lutheran Chapel on U Street, N.W. This organ was replaced with a spinet style Hammond Organ in February, 1938, a memorial gift from Miss Louie Dale Leeds. This instrument was moved upstairs to the chancel at the time we dedicated our completed church in January, 1958. Although this Hammond Organ was not suited to the size of our large nave, it served until we dedicated our custom designed Allen Electric Organ in November, 1963. In January of 1983 an Organ Committee was formed to look into the deficiencies that our aging electronic instruï¿½ment was beginning to show. In November, 1983 the committee recommended to Church Council that we began the search for a builder for a new instrument for St. Paul's rather than attempt a rebuilding of the Allen organ. Durï¿½ing the next 15 months the Organ Committee met with representatives of organ builders, made 27 site visits to Churches and factories, and met with several consultants. 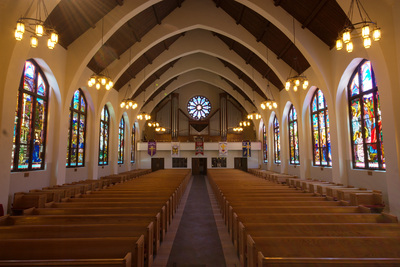 A final recommendation was accepted by Council and subsequently by majority vote of the congregation in February, 1985 to contract with the Schantz Organ Company to build a pipe organ for St. Paul's. The total cost of the organ installed is $325,000 including budgeted items and special memorial gifts. 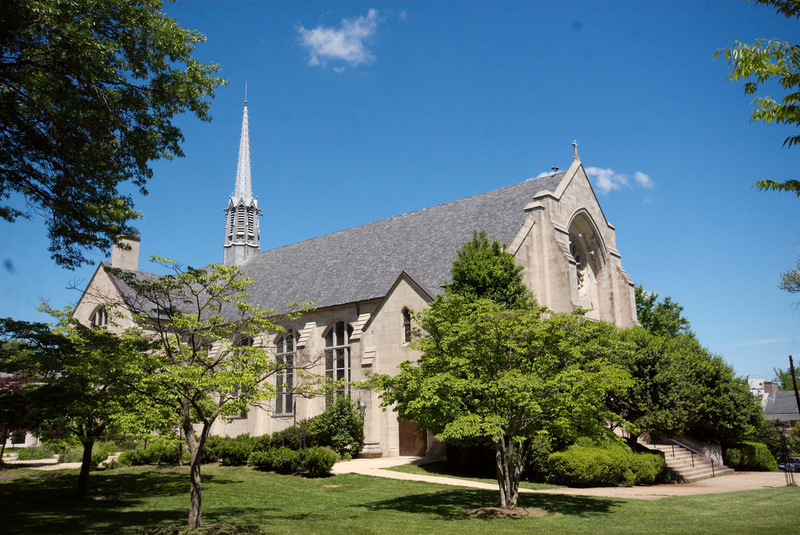 The comï¿½mitment and response of the congregation and friends to this sizable investment has led to this exciting new day in the life of St. Paul's ministry for continuing our traditions of meaningful worship and Christian service with new vigor. Music vitalizes and intensifies the meaning of the words of our liturgy. It evokes worship, inspires it and susï¿½tains it. With the Organ the public worship of God begins, continues and ends. 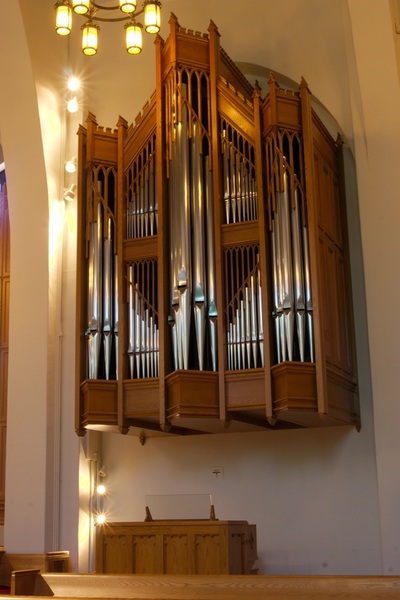 Throughout Church history the pipe organ has been acknowledged as the instrument of the Church. 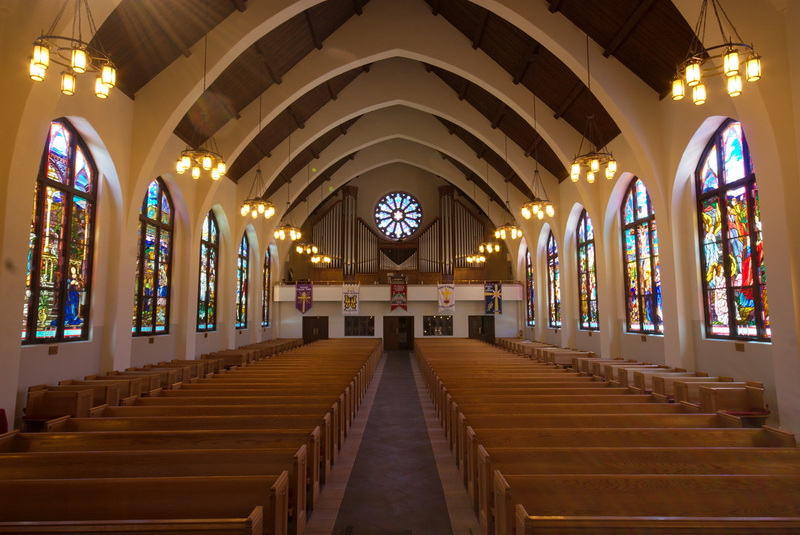 Having many distinct varieties of tone color and wide dynamic range, a pipe organ has the capacity to stir the heart whether played softly and reverently, joyfully, or with majestic power. The total scheme of this instrument is basically eclectic; that is, it combines the essential elements of the classic and romantic organs and is capable of rendering organ literature of all periods effectively. It is in reality four organs in one; Great, Swell, Positiv, and Pedal, totaling 58 ranks or sets of pipes. As you face the organ in the rear gallery, the great division is located on the left. The Positiv, a lighter antiphonal answer to the great organ, is to the right. In the center is the enclosed division, the swell, which is the most colorful of the divisions capable of wide dynamic range. The louvered shutters on the front side of this enclosure permit the organist greater control over the range of this division. The pedal organ with its corresponding bass pipes, are visï¿½ible across the facade of the casework, most noticeably in the majestic towers on each side of the rose window. Other pipes of this division are distributed across the rear of the instrument. Mounted under the rose window and facing directly into the nave of the Church is the Trompette en Chamade or festival trumpets, finished in polished copper with fluted bells. In addition to our four major divisions, the organ includes 25 note chimes and a reversible star Zimbelstern. The four manual console features a combination action capture with eight memories whereby complete organ configurations can be stored and easily recalled. The console is movable and supplied with long cabling to allow flexibility in positioning the console.